Most people want to have a beautiful smile. Between brushing twice a day and doing their best to remember to floss, there are different ways people create and maintain a stunning smile. However, not everyone is able to create a smile as easy as others. Physical injuries, gum disease, and tooth decay can all result in a loss of teeth. 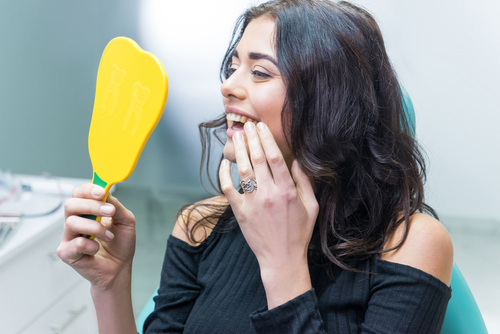 However, there is no need to be embarrassed by a lack of teeth; Irvington Dental Group is able to fix smiles through dentures, dental veneers and implants in areas including Newark, East Orange, and Irvington, NJ. Specializing in dental implant services for people of all ages, our team is proud to help establish a beautiful smile for anyone. While millions of people suffer from a fear of going to the dentist, we go to great lengths to ensure every patient is comfortable and relaxed during all of our treatments. At Irvington Dental Group, the highest standards and practices in the dental industry are always being taught and mastered to bring the best possible service to every patient. Those looking for dental or denture implants to help make their smile beautiful again should look no further than our staff. Getting a custom fit implant to help improve one’s smile can do a lot to improve someone’s confidence and how they look at themselves. On top of our premier services, we also help establish a great relationship between doctor and patient. Even with the advances we’ve made in regard to dental care, for many years, the only treatment options available for people with missing teeth were bridges and dentures. But, today, dental implants are available to improve anyone’s smile. Dental implants can range from permanent or removable teeth designed to match your natural teeth. A metal post or frame is surgically placed into the jawbone beneath the gums to position the replacement teeth to align perfectly with your smile. Dental implants are impossible to detect and have helped millions of Americans gain back the confidence of a perfect smile. Improved smile. Dental implants feel like they’re your own teeth, and they are even designed to fuse with bone, making them permanent. Even before the teeth have fused into your smile, dental implants are unnoticeable. Improved speech. Unlike dentures, which have the possibility of moving around within your mouth; implants are permanent, allowing you to speak freely without the worry of mumbling or slurring words. While dentures can be lost or damaged, implants are designed to be durable and usually able to last a lifetime. Those interested in undergoing minimally invasive surgery for dental implants from a quality dentist have come to the right place. Give us a call today at 732-410-6294 to get started on creating the perfect smile. Remember: You can contact us immediately if you’re in need of emergency dental care.